Camping rate charged for each site includes: one camping unit, one family - two adults, and all children under 17 years old, and a maximum of two cars per site. Additional adults are $3/day - $6/night per visitor 18 years and over. 6 max. adults per site. All guest must be registered and display a cars pass. No smoking or pets allowed in cabins or trailer rentals! Please keep your pet on a leash and quiet at all times. They should not be left unattended. Pets are not allowed inside our cabins/travel trailers/park models or on the grounds of cabins/cottages. $200 cleaning fee and immediate eviction apply. Pets are not allowed in any building, rental unit, pool area, playground, mini golf, or jumping pillow. Due to our insurance restrictions: Pitbulls, Dobermans, and Rottweilers are not permitted in the park. $365 + $10/nt. holiday prem. $330 + $10/nt. holiday prem. $300 + $10/nt. holiday prem. $460 + $10/nt. holiday prem. $860 + $10/nt. holiday prem. $990 + $10/nt. holiday prem. Book 2 consecutive nights on a water/electric or full hook up campsite and get the 3rd night 1/2 price. This includes ALL sites, including rentals! Discount on the campsite only, not on extra adult or camping units. Not to be combined with any other discount. We will honor which ever discount is the best rate for you. (Good Sam's, weekly stay, etc..) Not eligible on these holiday weekends: Memorial Day, Star Spangled Spectacular, Let Freedom Ring or Labor Day. 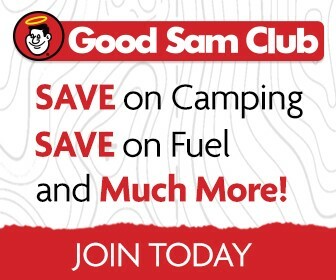 Good Sam Members are eligible for a 10% discount on campsite reservations of 6 days or less. Must mention discount while making the reservation, cannot be applied after payment is made. Must be a current Good Sam member, card must be shown at check in or discount will be removed. Only good toward campsite reservations. Cannot be used toward rental units, golf carts or any other purchases. Cannot be used on reservations of 7 or more days. Only to be applied to reservation of Good Sam member- cannot be used on multiple sites for the same dates. OCC observes the following as premium holiday weekends: Memorial Day, Star Spangled Spectacular, Labor Day, Spooky Halloween and Harvest Halloween. These will be an additional $10.00/per night. Memorial Day, Star Spangled Spectacular, Labor Day weekends are 3-night minimums for 2019. Halloween’s are a 2-night minimum. Rates are subject to change without notice. All discounts, gift certificates, and vouchers are to be mentioned while reserving and shown at check-in. NO discounts on already discounted rates and no refunds if not mentioned at time of reservation. Make sure to Like Us on Facebook to be up to date with everything happening at OCC! Cabins: Check in is 3 p.m. Check out is 12 p.m.
Two vehicles per site; please no parking on roads. Visitors must leave by 10:30 p.m. or pay an additional $3.00 for overnight. Golf Carts: Visiting golf cart fee is a one time/summer fee of $25. It is a requirement that you must provide the office with proof of insurance and abide by campground rules/policies.